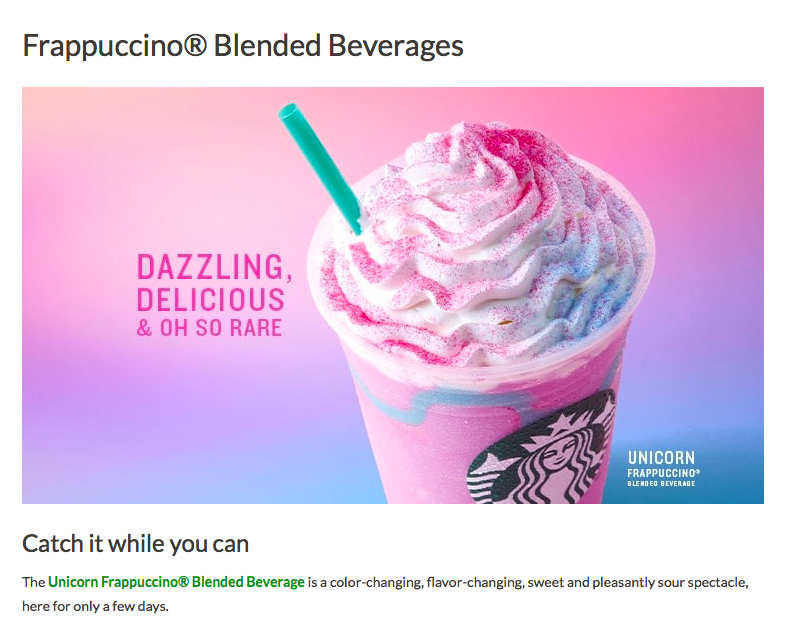 The other day, my husband told me Unicorn Frappuccino would be available for a couple of days, and luckily, I just came back a day to the states before the launch date, April 19, 2017. 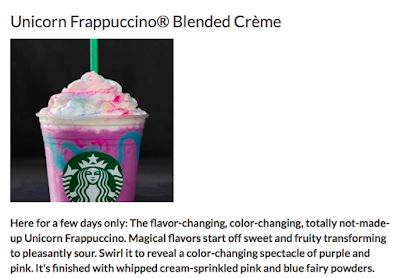 This limited time Frappuccino is sold until the 23 at participating locations in the states, Canada and Mexico. 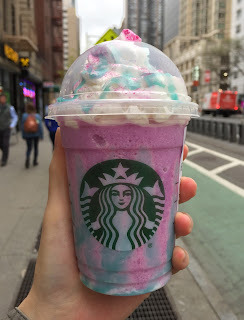 I woke up early in still-dark morning due jet lag and thought of going right away, however, I was skeptical about the availability of the ingredients at some locations and also, it's a busy hour before work and Frappuccino takes several steps so that I decided to go in the evening. 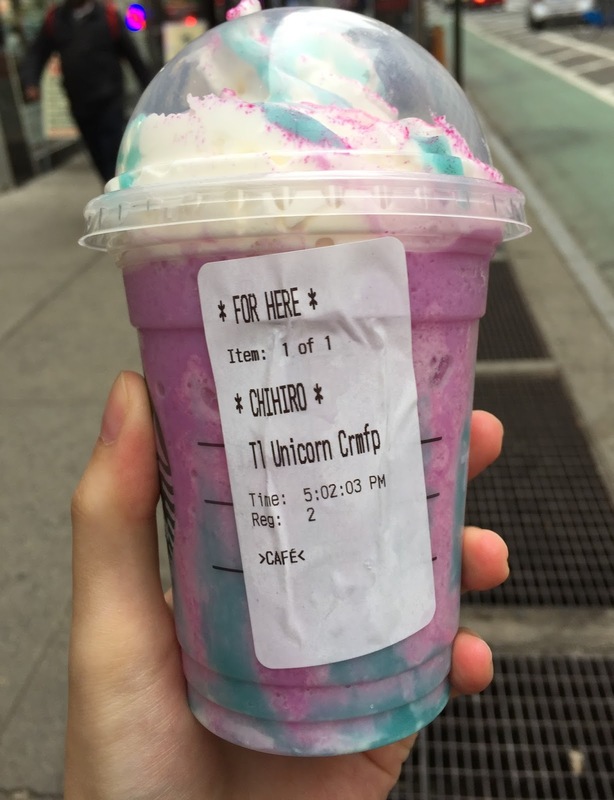 The cafe I went to didn't have any signs or drawings of Unicorn Frappuccino but it's an official product so that I had the HP ready on my phone to show at the cashier. At the cashier, I showed the HP and asked if they had Unicorn Frappuccino, and the cashier said yes so that I got the smallest size in the states, which is Tall. He asked me if I wanted whipped cream on top and I asked for it. 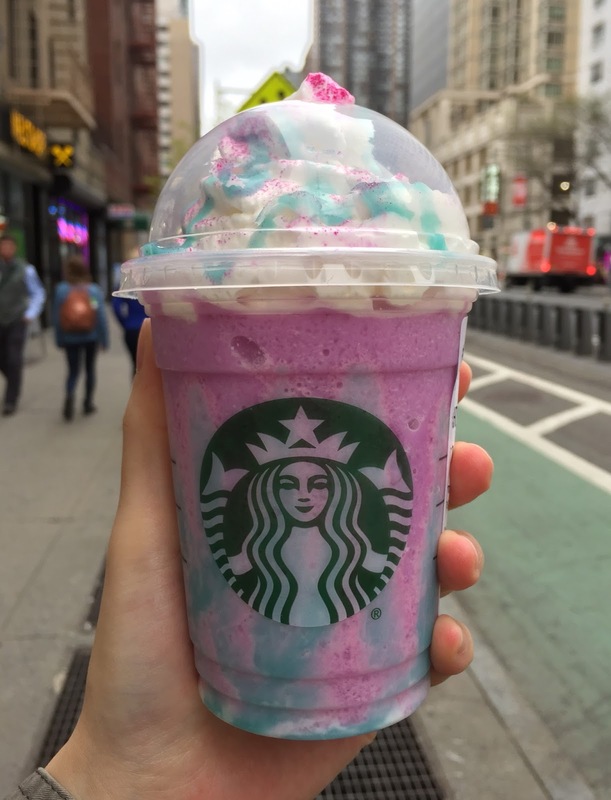 They drizzled light blue sauce on the cup first, poured the pink-purple icy beverage, squeezed whipped cream and topped with the blue sauce and pink powder. The cashier asked my name when I ordered, so I asked him to guess the spelling, and when he asked, "Is it Xi? or CH?" I let him choose. To my surprise, my name was written correctly and I got speechless (with joy). 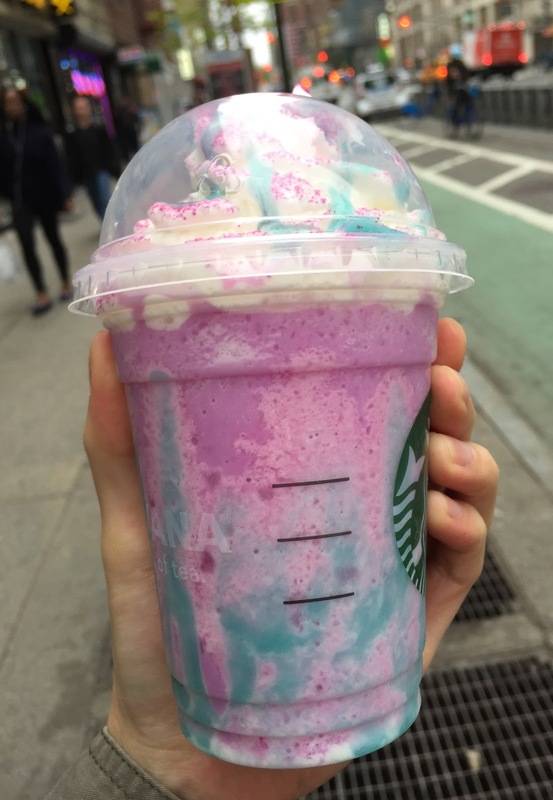 "The flavor-changing, color-changing, totally not-made-up Unicorn Frappuccino. Magical flavors start off sweet and fruity transforming to pleasantly sour. Swirl it to reveal a color-changing spectacle of purple and pink. 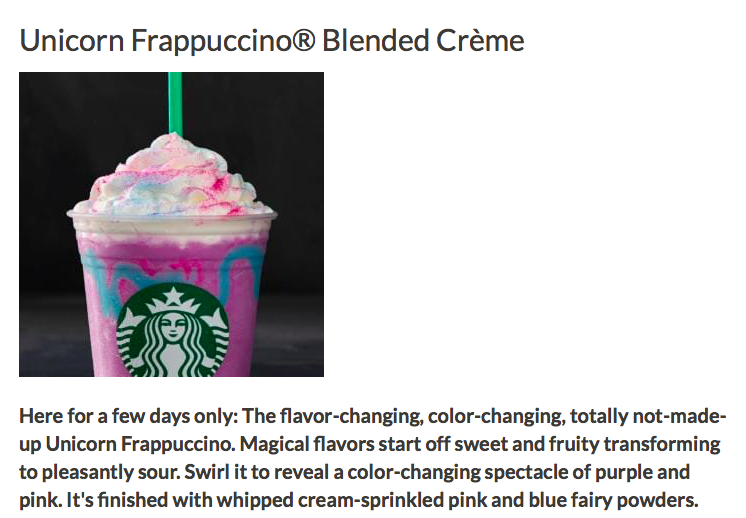 It's finished with whipped cream-sprinkled pink and blue fairy powders." 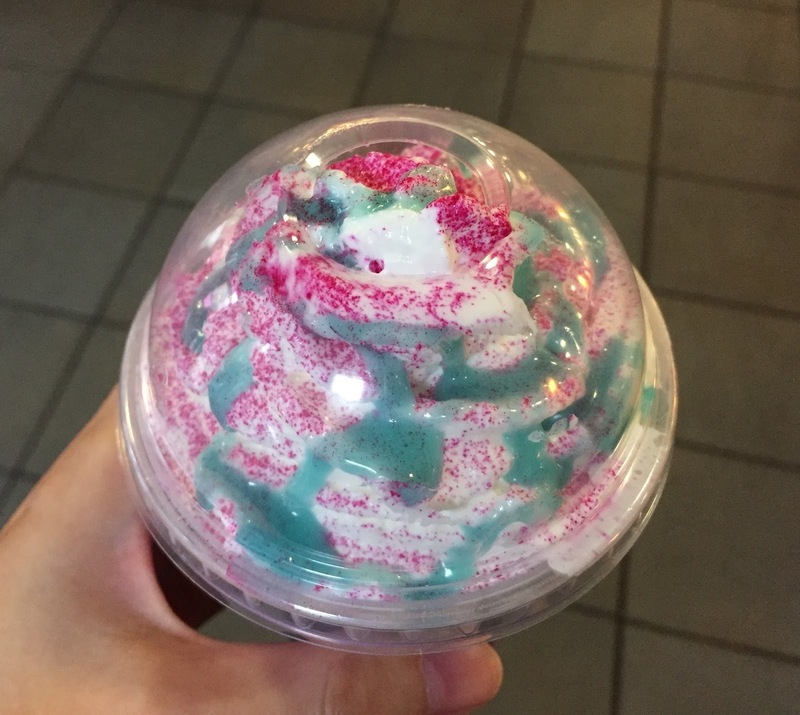 It tasted like Greek yogurt since it had little sourness, but it might be because of the powder on top that was brought to the bottom when I stuck the straw. Soon it became sweet and fruity, then again sweet-sour tangy flavor appeared. It's a Creme base Frappuccino with mango syrup, blue drizzle that was like chocolate syrup with some sourness and sour powder without caffeine, thus it's a pack of sugar and fat beverage; I'm not complaining and many intake carbs (=sugar) anyways with or without knowing. 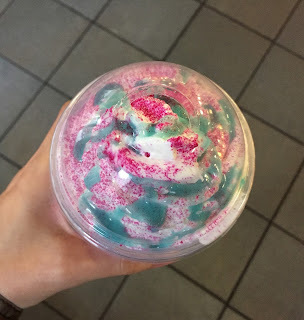 Thanks to the sourness similar to Sour Patch Kids, this fantascital-color Frappuccino was refreshing. Though the description says, "pink and blue fairy powder," there's only vivid pink powder.